When I started this site over two years ago, I often wrote a post daily. Since then, my knowledge in the field has increased, and with that has come exposure to more and more resources, both online (websites, Google Books, JSTOR) and offline (I have no room in my house for any more dictionaries!). Additionally, I've met a great number of very knowledgeable people through this site, many of whom I like to consult before publishing a post. So the research needed to prepare a post has increased dramatically. That, together with my consistently shrinking "free time", has made my posts less frequent. From once nearly daily, I'm down to one a week - on a good week. But it is important for me to let my regular readers and the new ones who visit this site all the time (Hi! Welcome!) that my interest obsession with Hebrew words and their history is constantly active. So I've joined the site Twitter (would that be צִיּוּץ in Hebrew?). Twitter here will sort of serve as a "blog inside a blog". You can find it in the sidebar to your right, and I'll try to update it frequently with a sentence or two about the words I'm thinking about, questions I have, sources I'm looking for, etc. Feel free to email me with any ideas you have about my Twitter updates. 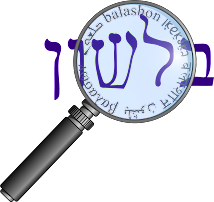 And one unrelated side note: Firefox 3 was recently released, and I found that Balashon was linked to in a Mozilla forum as an example of problems with Hebrew in the new version. I'm not sure there's anything I can do from my side, but if you have trouble reading the Hebrew, or the vowels don't show properly, please let me know.